Belgium international Eden Hazard has refused to confirm whether his allegiance will remain with Chelsea when the current season comes to a close. The attacker has been in sublime form for the Blues this term and he recently bagged his ninth and tenth league goal of the season as his side secured a 2-1 triumph at Watford. Amidst this, the speculation linking him with Real Madrid has refused to cease and speaking to Sky Sports, he has acknowledged that any decision over his future would be made in the summer, he said: "I will see at the end of the season. I am just focused on the pitch." 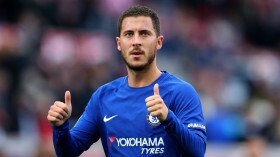 Chelsea are currently holding a two-point advantage over Arsenal in the pursuit of the final Champions League qualification position and reports have regularly indicated that the return to the competition next term may tempt Hazard to remain. Still, the Blues need to find a breakthrough with regards to his contract which expires in 18 months' time and the New Year could give a fair reflection whether the attacker has any plans of committing his future to the club.